We did a little bit of cleaning last week and stumbled across a ton of old scratched DVDs & CDs that do not play anymore. Since I hate throwing anything away, I was determined to make use of them. CDs are wonderful for a variety of crafts, but my favorite use for them is for making simple printmaking projects. These CD printed fall trees are quick, easy and perfect for the fall. Hi everybody. I hope that everyone is having a fun-filled summer. We are not here today to share our usual arts or crafts project, instead, we have some exciting news. We are thrilled to announce that we have just published our first children’s book, ‘Farmer Pete Has Stinky Feet’. It is sweet and silly and a little bit “pun”ny. We are absolutely over the moon about it and hope that you will check it out. It is Harry Potter mania in my house. My daughter and I just finished book one, The Sorcerer’s Stone and are now moving on to The Chamber of Secrets. She is in love with all things Harry Potter and so am I. This past week the focus has been on Hogwarts Castle. I love castles and with all of the Harry Potter talk in the house I felt inspired to paint a little bit of Hogwarts. This kicked off our castle projects. We have been practicing drawing and painting castles and made these fun castle silhouettes with watercolors and construction paper. This week I am lucky enough to be directing the arts and crafts portion of our town’s summer camp. I have a group of fun and creative campers that are a joy to work with. While playing around with different materials and ideas today we came up with this flying fairy in a jar craft. I was so excited at how adorable they came out that I had to share it with all of you. Landscape projects are a favorite of ours. I just adore the soft and peaceful feel of them. There are so many pretty scenes that you can create and there is a variety of ways in which you can do it. We dabble with different ways to create landscapes all the time and we love seeing and trying other ideas that we see too. We love this collection of fun and creative landscape projects for kids and we think that the adults will have fun with these too. I know that I do. Whether you want to use paints, pastels, construction paper, nature, magazines or even food, we have a beautiful landscape art idea here for you. I love landscape art. Winter, spring, summer, or fall, it doesn’t matter. I love them all. And we love using different techniques to make our pretty landscapes. We have made beautiful landscapes using forks, yarn, sponges and now cardboard. These paint scraped landscapes are quick and easy to make and we just adore how they came out. We love crafts in motion. You get to create something wonderful and then have the added bonus of getting to play with it after. This driving car craft is a new favorite of ours. Watch your car drive through the city or a country road. Wherever you want to be, your little car and your imagination can take you there. Just draw or paint your landscape and make it happen. Father’s Day is almost here!! If you are looking for a special project for dad that the kids can make, look no more. This Father’s Day bobble head is both cute and silly and is sure to creates some smiles and maybe bring out a few giggles too. This post is sponsored by Reading Eggs. All opinions are my own. Please read our Disclosure for information on sponsored posts. 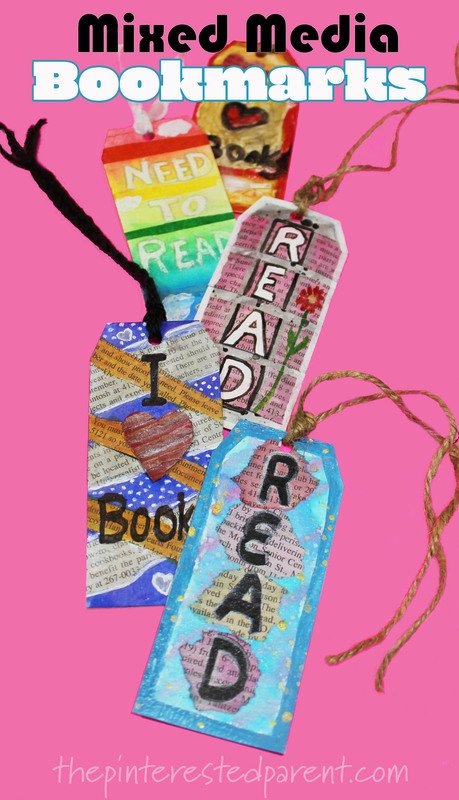 If you have a reader and crafter at home, these mixed media bookmarks are a great idea. I have been reading to my little girl since the day that she was born. Reading is an important part of my life and I wanted to make sure that it was the same for my daughter. I tried teaching her to read as soon as I thought that she was ready. She loved books, but it was no easy feat. She was resistant and would get frustrated easily. This year, she started Kindergarten and it became even more important for us to work on her reading together. Still, she did not like working with mommy and then we were introduced to Reading Eggs. A special thanks to Shikha from The Joy of Sharing for sharing this wonderful Pete the Cat inspired puppet craft with us. She has a lot of fun and creative ideas, be sure to head over to her page. Hello! I am Shikha from The Joy of Sharing. Craft is my passion. So much that, my three-year-old daughter and I create crafts together in her play time. My daughter loves doodling and cutting so it’s a lot of fun for both of us. I love sharing easy , fun and educational crafts that can be created by moms with their tots or preschool teachers with their students. Happy crafting! Pete the cat is wise and funny. That’s why we introduced her to our tot in the last few weeks If our tot adopted Pete’s attitude early in her life, she would take a lot less stress and be a happy person. So, this post is to celebrate this spunky book character in our characteristic craft style – a paper bag puppet craft of Pete as the tooth fairy. It turned out really well with her magic wings while giving our tot some preparation for the future: she will lose some teeth but should she panic? Goodness No! Pete does not panic! Enjoy making this craft with your little ones and see them pick up some life skills on the side. See it in action here!